Canon EOS M6 review: Canon's best mirrorless yet, but is that good enough? Buy the M6 without trying any other cameras out there and you'll be more than happy. But if you play with the competition then you'll see the M6 can't be considered king in many regards. Wait for the price to drop, however, and Canon is - finally - getting its finger onto the mirrorless camera pulse. The Canon take on the mirrorless camera market has been interesting: having lackadaisically introduced the M-series system in a bid to avoid undercutting its own DSLR business, it had taken Canon years to establish a more viable M-series camera. That happened in 2016 with the EOS M5. Move into 2017 and the Japanese maker is now concentrating its moves in mirrorless, with the step-up EOS M6 further enhancing the line-up with a more comprehensive control system, while ditching the built-in viewfinder (an accessory one can be added). It's altogether less DSLR-styled and, finally, begins to put Canon in a position where its mirrorless product is genuinely capable. The problem the M6 faces, however, is that it's not particularly competitive. With the likes of the Panasonic Lumix GX80 and even viewfinder-toting Fujifilm X-T20 offering more for the same asking price, is the M6 relying on its Canon brand name beyond its capability? 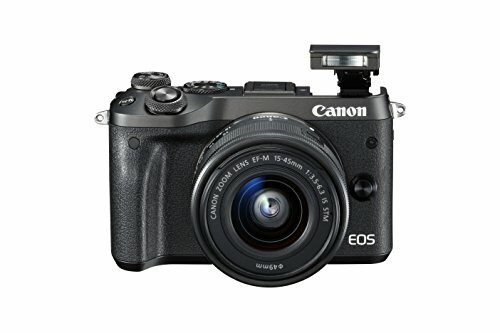 Canon EOS M6 review: What's new versus M5? The main difference between EOS M5 and M6 is their physical design - the M6 cutting out the viewfinder compared to the M5's built-in solution. But just because it's done away with the finder, that doesn't mean it removes the possibility of having one: as the hotshoe up top shows. The M6 also adds a stacked control dial, which is a feature we've seldom seen from Canon (think of the G7X compact and the like). It makes using the camera simple without being overcomplicated, avoiding those deep-dive menu digs that older M-series cameras demanded. Interestingly, Canon has avoided the "Guided UI" in the M6 - which is designed to assist relative newcomers to understand what each shooting mode does, represented in a visual form - unlike in the EOS 800D DSLR. We think that newcomers and established photographers will grasp the M6 without issue though. The overall look of the M6 is rather high-end, dressed in a shiny silver-colour finish for the review sample we've been loaned - it's altogether less plasticky in look and feel than the larger M5. The M6's body is relatively small, too, but as Canon uses a larger sensor than, say, the Panasonic G-series cameras, it's small rather than pocket-sized in scale. Canon EOS M6 review: How does it perform? The M6's autofocus system is the same 45-point Dual Pixel AF setup as you'll find in the earlier M5 (plus EOS 80D, 77D and 800D (ignoring their through-the-viewfinder setups)), which delivers on-sensor phase detection autofocus, paired with contrast-detect autofocus, for speedy results. And it genuinely works well - just as we said of the M5. It's quick and doesn't need to hunt excessively to find focus, although the included 18-55mm kit lens with this model has a maximum aperture limit of f/5.6 at its full extension which isn't particularly effective in low-light conditions. There are other more capable lenses available, however, should you want to splash out some extra cash. But there's a caveat to that focus system: the three focus options - 1-point, zone and tracking - lack the complexity of the competition, such as the Panasonic Lumix GX80. The Panasonic offers a Pinpoint focus mode, for example, which offers a more refined method for, as the name suggests, pinpoint focus acquisition. We feel the Panasonic is faster and the better established system of the two. Given the EOS M6 is £840 with its kit lens and isn't compatible with Canon's (EF/EF-S) DSLR lenses without an adapter, therefore there's a good argument to lean towards a different mirrorless system if you're looking for more advanced focus options. Another slight difference in the M6 compared to the M5 is the way its screen is mounted on the variable bracket: it can't flip around to face forward for selfies, but we don't think that's any major loss. It does tilt upward, however, which is a must-have feature for us these days. It's easy to manipulate the screen to position it for waist-level work, or less conspicuous shooting. What's best of all about the screen, however, is its touch-sensitivity. It's responsive, with sensitivity options within the menu allowing for responsiveness adjustment to your preference, which is something other manufacturers ought to take into consideration. Either a tap on the screen or a press-and-drag will move the autofocus area with ease, making the M6 system about as easy to use as a smartphone. If you're really keen for a viewfinder then, well, it'd be cheaper to consider buying the M5 instead (even if it's not as nice looking a camera). The EVF-DC2 accessory finder for the M6 - which offers a 2.36m-dot resolution over its 0.39-inch panel - is only likely to make sense if you have other compatible Canon compact cameras. But it's a feature that we'd rather have than not, so no harm done there. We've found the EOS M6 to perform ok, then, but what really sets it apart from much of the competition is the resulting image quality from the 24.2-megapixel sensor at its heart. This is Canon's speciality and, ultimately, the reason to buy an M-series over most competitors (although we think Fuji gives it a run for its money). When shooting in great lighting conditions the sharp results at ISO 100 look colourful, bright and crisp. The higher ISO sensitivities aren't shy of displaying a touch of image noise, though, as we said of the EOS M5 - but that helps to keep extra perceptible sharpness in those lower-light shots and a greater sense of realism to the images. Because Canon uses a larger sensor than most of its mirrorless competition, it has that advantage of more room to play with. The biggest caveat to image quality, as with any interchangeable lens camera, is the lens on the front. And that 18-55mm isn't all that; it's a bit soft towards the edges, which doesn't give the best universal soft background effect, while sharpness isn't as biting as we found with the 50mm f/1.8 we used with the EOS M5 camera. Interestingly there are heaps of Canon EF lenses that can be used with the EOS M series. Well, if you buy an adapter. Problem is that adapter adds mass and the lenses protrude further from the body, which is unavoidable given their design, but it then makes us wonder why not just buy, say, the 800D DSLR instead? That's an ongoing battle in Canon's mirrorless versus DSLR line-up. Anyway, back to EOS M6's capabilities. It's the second interchangeable Canon camera to implement Digic 7 processing, which means it's super-fast, able to shoot at 7fps in continuous autofocus mode. With the right SD card on board the buffer is significant too, avoiding clogging-up after taking a batch of images. It's no Fuji X-T2 beater, but it won't exactly limit you. It's a 4K world these days, with the likes of Panasonic, Fujifilm and, well, just about any maker pushing 4K movie capture. Not so with the Canon EOS M6: it's limited to Full HD (1080p) instead. The frame rates are all-encompassing, though, with 60/50fps for smooth capture, or 24fps for a more cinematic look if you wish. We shot some alligators in Louisiana and everything looked silky smooth in motion. There's also a 3.5mm microphone socket, but no headphones jack. So if you're looking for a miniature interchangeable lens camera for high-end video work, ultimately the M6 isn't the one. It's all about casual shooting, with touchscreen autofocus adjustment making that just fine and dandy. The M6 also supports Bluetooth LE (low energy) and Wi-Fi, which bubble away in the background for remote control of the camera via the associated smart app on a phone or tablet. This is a pretty smart move, as the constant connection and re-connection of cameras when it comes to smart apps is overly fussy. If you find much use for remote controlling the camera in the first instance, that is. The Canon EOS M6 is as much a success as it is a conundrum: it's well built, easy to control and works well thanks to that tilt-angle touchscreen and combination of physical dials. In that regard this is Canon aligning its mirrorless camera into its best position to date. What acts against the EOS M6, however, is that it ultimately isn't better than the competition. The Panasonic Lumix GX80 has better autofocus and offers 4K video smarts for the much less money. The Fujifilm X-T20 embodies the shiny, retro style with similar performance - and, pound for pound, throws in the viewfinder for free. The Canon is fine, but fine doesn't always quite cut it. What will sell the M6 are two things: the brand name and the resulting image quality. Sure, it lacks a bevy of EF-M lens availability, while its competitors have more native glass options, but the quality that comes straight out of this camera is great. Buy the M6 without trying any other cameras out there and you'll be more than happy - that's the crux of it. But if you play with the competition then you'll see the M6 can't be considered king in many regards. Wait for the price to drop, however, and Canon is - finally - getting its finger onto the mirrorless camera pulse. Similar in style, but more affordable, more capable with autofocus, and full of more features too. It might not look as silver and shiny, but Panasonic betters the EOS in almost every regard. It's a fair bit bigger on account of a built-in viewfinder - which, by the way, is excellent - but the Fuji can easily take on the Canon in terms of image quality, plus has heaps of features to boot.